Marshalsea Prison was active from medieval times through 1842. 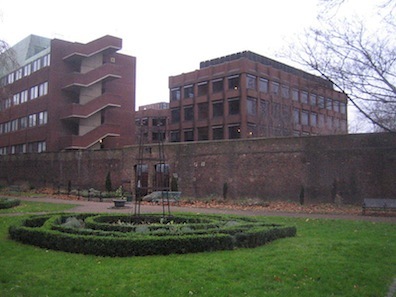 The original gaol (prison) was on the south bank of the River Thames, near Mermaid Court in Southwark. The exact date of its construction is unknown. It was initially used to hold pirates and smugglers and other people who committed crimes at sea. It was destroyed by rebels in 1381, and then again in 1450. Under Elizabeth I, it was used as a prison for debtors, as well as dissenters. But it was also used to house people who simply defied authority. Poet Christopher Brooke was imprisoned at Marshalsea in 1609 for helping his friend John Donne marry Anne More – without Anne's father's consent. 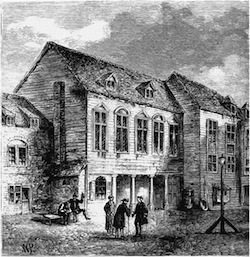 A debtor's length of stay at Marshalsea was often at the whim of the creditor. The prison was run privately, and for profit, and spanned the gamut from luxurious to squalid. There were two separate area for prisoners - the master's side, which consisted of rooms for rent and the common side, where people were locked up. 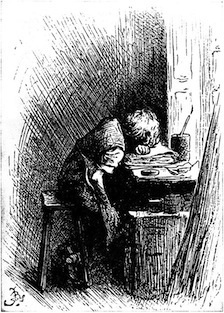 As long as they didn't cause trouble and paid their rent, families were allowed to live on the master's side, which was the case for Dickens' family. If a debtor could pay, he was allowed access to a bar and restaurant, as well as the privilege of leaving for the day, which was critical because then he could work, make money, pay off his creditor and, ultimately, be allowed to leave. Those who weren't so lucky, though, were crammed into small rooms, unable to pay off their (sometimes even modest) debts and then racked up prison fees on top of what they already owed. Marshalsea fell into such disrepair in 1811 that it was closed down. Rebuilt nearby, next to St. George's Church, the new prison is the one that Dickens knew so well. He described it in Little Dorrit as "an oblong pile of barrack building, partitioned into squalid houses standing back to back, so that there were no back rooms; environed by a narrow paved yard, hemmed in by high walls duly spiked at the top." He told John Forster (his biographer, critic and friend) what his father desperately said to him: " If a man had twenty pounds a year, and spent nineteen pounds nineteen shillings and sixpence, he would be happy; but that a shilling spent the other way would make him wretched." Mr Micawber gives the same advice to David Copperfield in Dickens' most autobiographical novel. Charles Dickens kept his father's prison experience a secret his whole life. Marshalsea Prison in the 18th century, uploaded by SlimVirgin. A rendering of Charles Dicken's at work in a factory by Fred Bernard. The remaining wall of the Marshalsea Prison, photo courtesy of SlimVirgin. This "beyond the book article" relates to The Devil in the Marshalsea. It first ran in the June 18, 2014 issue of BookBrowse Recommends.